Thank you for playing Dim Sum Robot #1. 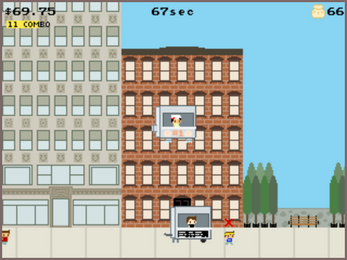 You might need to click on the game to enable the controls. Your Dim Sum Robot has three modes. Stand Mode : The default mode. Traverse short distances and quickly enter serve mode or fly mode. Serve Mode : An essential mode. Serve customers, but don't waste time remaining stationary. Fly Mode : An advanced mode. 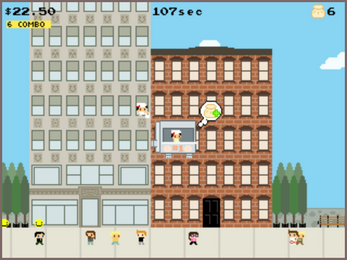 Collect more dumplings from the man in the window, move quickly around the screen, and attack competitors. Each mode is important, but only advanced pilots can manage perfect transitions between them. Analyze each situation to determine your best opportunity. Drop multiple bombs at the begi▓▓▓▓▓▓▓▓▓▓ enable different ▓▓▓▓▓▓▓▓▓▓▓▓▓▓▓▓. There are thr▓▓▓▓▓▓▓ ▓▓▓▓▓▓▓▓▓▓▓▓. Use with caution. Don't have enough dumplings to finish an order, but don't want to break your combo? Serve as many dumplings as you can to reduce the customer's chance of becoming angry. They won't pay for the order, though! High combos are important - they lead to time extends and bigger tips! Please make sure to maintain a high combo. Bombs cost ten dumplings, so use them skillfully! Some people say there are cheaper bombs available, but it's probably just a hypothesis.